One of the greatest ironies of the anti-vaccine movement is that its proponents imagine themselves to be deep, incisive thinkers when they are the exact opposite. Their beliefs reflect immature cognitive errors and a spectacular failure of critical thinking. [Critical thinking is] thinking about one’s thinking in a manner designed to organize and clarify, raise the efficiency of, and recognize errors and biases in one’s own thinking. Anti-vaxxers never ask themselves what they DON’T know. Critical thinking is often contrasted with traditional education techniques like lectures and memorization. Whereas lectures and memorization result in students who remember the important dates of the Revolutionary War, for example, critical thinking leads to students who understand why the war happened. In my view there are four pillars to critical thinking and those pillars can be expressed as self-directed questions. 2. How do I know it? 3. What don’t I know? 4. How can I learn it? Both critical thinkers and uncritical thinkers like anti-vaxxers are clear on what they know. The differences are encompassed by answers to the other three questions. For uncritical thinkers like anti-vaxxers, the answer is simple and concise. They “know” that vaccines are harmful because someone else told them so. They like to dress it up in their own minds by insisting that they “did their research,” but what they really mean is that they ignored experts and chose to believe random people on the internet. Anti-vaxxers have never seen the inside of a laboratory or a medical library, the places where real medical research occurs. Most have never read a single scientific paper beyond the abstract and wouldn’t understand one if they did. They lack basic knowledge of immunology, statistics and the scientific method. They have the cognitive maturity of a four year old who imagines that addition and subtraction reflect the sum total of knowledge in mathematics. They are so limited in their understanding of science that they don’t even understand their limitations. Anti-vaxxers imagine themselves as bold thinkers because they reject the assertions of experts without realizing that reflexively rejecting experts is the same as reflexively embracing them. Neither involves thinking; both are responses to authority. In contrast, critical thinkers know what they know by reading authoritative texts and scientific literature. In addition to reading expert literature that confirms their beliefs, they are fully conversant with the scientific literature that questions their beliefs or contradicts them. The breadth of knowledge of vaccine experts exceeds that of anti-vaxxers by orders of magnitude. This is where the rubber hits the road in critical thinking. Critical thinkers always ask themselves what they don’t know, recognizing that gaps in knowledge can lead to faulty reasoning. Anti-vaxxers never ask themselves what they don’t know. Their cognitive immaturity (and their vanity) leads them to imagine that they know everything worth knowing. They lack the critical thinking skills to answer their own questions. Since they have no understanding of the scientific method, they can’t appreciate that a single, out of date paper is meaningless; only the breadth of the entire literature matters. Since they are incapable of reading that literature, they have no idea what their preferred paper actually shows; they only know what some other anti-vaxxers told them it shows. They don’t even know if the paper was contradicted by subsequent research or even retracted due to violating principles of scientific reporting. Since they have no understanding of statistics they are ignorant of the fact that disease incidence can fall from one year to the next without it being evidence that the disease is disappearing. And although they claim to reject arguments from authority they are quick to embrace arguments from anti-vax celebrities. How can I learn what I don’t know? Anti-vaxxers don’t know what they don’t know so they are unlikely to ask themselves this question spontaneously. However, as soon as they engage with people who know a great deal more (which is nearly everyone who has professional education and training), they become aware that there’s lots they don’t know. Critical thinkers will attempt to remedy their deficits. They will do background research in science and statistics; they will review the entire literature; they will seek out help reading and interpreting scientific papers. Anti-vaxxers, who are cognitively immature, will respond immaturely — accusing anyone who knows more of being a shill for the pharmaceutical industry. It’s the intellectual equivalent of calling your opponent a poopy-head. Anti-vaccine advocacy reflects a spectacular failure of critical thinking because it is missing one of the pillars: interrogating oneself to determine what you don’t know, not merely what you do know. Anti-vaxxers flatter themselves by imagining that they are engaged in deep thinking when they haven’t been thinking at all, just dumbly imbibing, believing and repeating nonsense from other equally ignorant fools. Is that supposed to be an rebuttal? Thank you for demonstrating the spectacular failure of critical thinking of anti-vaxxers! Citations to the ‘actual research’ or shut up. Also, I sincerely doubt you’re any kind of medical professional, as most doctors are more than happy to use technology available to them, not so they can bill more, so they can, you know, save lives. I’m guessing you’re a naturopath. I was going for Reiki practitioner. Remember the time we had someone claiming to be a “medical professional” and it turns out they were a hospital janitor? Probably still a better source than a naturopath. Semi OT: With regards to the antibodies in breast milk, we know that IgA antibodies are expressed in the milk. Are there studies to show they are absorbed by the baby, and aren’t simply broken down by the digestive process? Hehe, this vwcanter lady is a gem. Lapping at midwives’ every word and fancies herself so smart and educated. The anti-vaxxers in my world are control freaks with too much time on their hands. They also think they are experts in many things-home design, the intricacies of divorce law, the real estate or stock market etc, and begrudge every cent they spend on actual expert advice, which they often ignore. They happily pay quacks and charlatans for preparations, chelation, massage etc, and follow weirdo diets to the letter. They possess great certainty, and struggle in the grey, which is where most of us actually live and thrive. Truth. I have yet to encounter an anti-vaxxer who didn’t consider himself/herself an expert on every subject. Once upon a time, humanity knew so little that it was perfectly possible for an intelligent well-educated person to know everything there was to know and to make truly ground-breaking discoveries in what are now several different fields. The more discoveries were made, the more we realised there was to learn – each discovery leading to new, vast areas to explore. For instance, people suspected micro-organisms of being the root cause of communicable diseases for centuries before there was first experimental proof, then magnifying tools which enabled us to see them; and this enabled specialised scientists to classify all the different types and then genera, species etc. We’re still learning, and even (especially?) experts in each field acknowledge that they cannot possibly know everything there is to know, even about one small virus. The members of the pro-disease cult are stuck at the intellectual level of a toddler who has discovered what insects are and learned the difference between a fly and an ant. Blissfully unaware that there are over twelve thousand species of ant alone, so their knowledge is trivial and superficial, the toddler argues that since they now know everything there is to know about insects, a spider is an insect. When challenged, the toddler points to a page in an illustrated board book about animals, which has a picture of a spider on the same page as a fly and an ant, to declare their assertion supported and proved. Reading the text, which doesn’t (of course) support their point of view, is something of which they aren’t capable. It is fruitless to point out to them that not only does their own example not support their stance, but also there are rows of books on the shelves which contradict them (and which they are also incapable of reading). As a toddler, they have absolute confidence in whatever they currently believe, and once they have decided they are right, no amount of arguing or persuasion will induce them to change their minds – only increasing maturity will do that, hopefully leading to a strong desire to learn more, so as not to be laughed at for being wrong. This is perfect. Thank you for yet another post that I can use as a reference. Their inability to acknowledge that there are vast areas of knowledge about which they know nothing seems to be linked to a huge, but fragile, ego. They will stubbornly keep repeating PRATTs, whilst totally ignoring simple requests to back up their assertions. For instance, a favourite tactic of mine is to ask them why, if vaccines are part of a conspiracy to commit genocide (a favourite assertion of theirs), has the population of humans on the planet trebled in my lifetime. They never, ever answer, but that’s not the point. I’m giving any fence-sitting lurkers something to think about. I think one of the important differences is that critical thinkers, scientists, researchers etc know that scientific advances are made in a series of little steps-there usually isn’t generally a big Ta-Dah! moment, its slow and tedious and continuously builds on work already done. This means that some of the conclusions reached in earlier papers may be outdated, proven incomplete, inaccurate or even wrong. However, papers aren’t withdrawn simply because of this (not unless there has been fraudulent behaviour, like Wakefield), so they remain as part of the general body of scientific and medical literature. But anti-vaxxers don’t understand this, that’s why many of the references they point to are decades old-their attitude is that if the paper is still accessible it must be completely true, so they use this data to support their beliefs, even though later work has discredited some of these findings. Anti-vaxers want to play it both ways, however. They argue that, because so many advances have been made in science, what we used to think was “wrong” (say, routine episiotomy or use of thalidomide for nausea in pregnancy), so nothing can be trusted. They fail to realise that progress is cumulative – very rarely by revolution. Also, it is medical science that discovered the evidence about episiotomy and thalidomide, and developed the knowledge of teratogenesis – not anti-science numpties, or naturopaths. Did my science teachers go above and beyond or did I simply pay attention to ordinary lessons? Because even -i- know science is quintuple checked itty bitty steps. I had excellent science teachers too, and I have continued to learn by reading science blogs and following the references. I don’t always understand what I am reading and I acknowledge that I have only the most superficial understanding of the workings of the immune system, but that is enough for me to see when someone is spouting utter nonsense. I also admit that I worked as a laboratory technician in medical research for three years from 1976 until shortly before I got married in 1979; the work was a very small part of the testing of potential blood pressure medications, the results of which research are now benefitting me, but I suppose that makes me a ‘$hill’. Hi fellow shill! I’m a shill because the house I live in was paid for by “big pharma”. Granted this was in the form of MrC’s paychecks, but it seems because he was a researcher for a pharmaceutical company, I cannot be unbiased. Or something. The way to approach anything particularly malodorous is not to try and mask it. In operating theatres they sometimes use peppermint oil or clove oil, and I’ve had policemen at autopsies using Vicks vapour rub under their nose (it’s a menthol scented goo), but that never works. The trick to dealing with smells is to take a few good deep breaths and flood your nose with it. Very soon your nose gets overwhelmed and shuts down in self-defence and you stop smelling it. Does the nose shut down before or after the vomiting? I don’t doubt your advice, but pretty sure there would be vomiting in their at some point, for me anyway. I never had a vomiting issue really. But I do say to the policemen who come to the mortuary that they need to have had breakfast before they arrive (it means they are less likely to faint, and if they are sick, its feel better throwing up with something in your stomach than it does just retching on bile). Most of the non-medics who react adversely tend to faint, rather than vomit though. The anti-vax celebrities comment is spot on. Some clown named Del Bigtree produced a movie directed by Andy Wakefield and starring Andy Wakefield in which Andy Wakefield says that Andy Wakefield was right all along about the MMR vaccine and autism, and immediately hordes of internet dumbasses are citing Bigtree as an authority on vaccine safely despite the fact that he has no education, training, experience or knowledge in any relevant field. In the mind of such a dumbass, a source is “authoritative” to the extent it coheres with the dumbass’s existing beliefs. I admit to mostly relying on what I’ve been told by authorities in vaccines. But I’ve read enough history books, some written long ago, where it’s mentioned off-hand about how this person’s brother or that person’s wife suffered from xyz. Antivaxxers would probably shout about big pharma shills, but it’s much too common for me to believe in the conspiracy theory. The amount of actual research by myself on vaccines is so tiny that I do not even disclose it on my CV, so I rely on other people’s work. I am not an expert on vaccines by any means, my area of expertise is completely different. I do hold an MD and a PhD but I would never pretend to be an expert in vaccines. Even with that basic knowledge I know a lot more that “google vaccine experts” and, the most important, I know where my knowledge deficits lie, so I do not decide the specifics of my son’s vaccine calendar (his paediatrician does). Those people are perfect examples of the Dunning-Krueger effect. Nobody can be an expert on everything. We all have to rely on experts in fields other than our own area of expertise. The key here, is to know the difference between what you are expert in, what you know an awful lot about, and what you know some things about, and what you know nothing about. You know what subjects fall into which categories, and you have enough basic knowledge to decide which experts are legitimate and which ones are charlatans, so you know which one to actually believe. That’s basically the entire battle right there. lol, quilting is a low value kind of expertise. I’m good at reading, too. See, the trouble with society is there’s an assumed low value on art. And quilting is absolutely an art. The fact that it also has a utilitarian purpose is a bonus. Ohhhhh! I like that one. It’s beautiful! It’s quite possible – one of their grandmas crocheted a baby blanket for each of kids before they were born. My 11-yo still sleeps under it. My 8 yo will have her blankie for ever, or at least until it falls apart 🙂 That is a beautiful quilt. My jaw dropped, that is gorgeous!! That is wonderful, and I agree that quilting is an underrated skill, not a low value one. 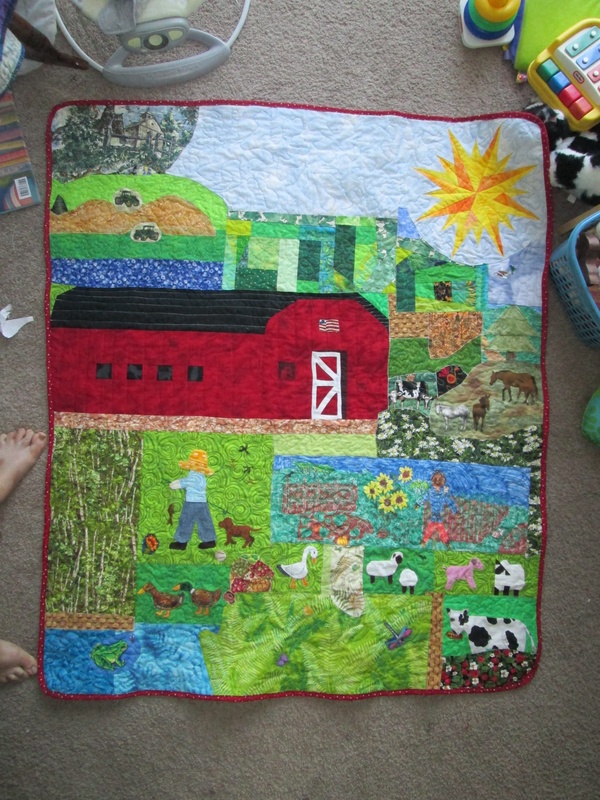 I am amazed at the amount of work and imagination that went into that quilt, and the result is a thing of beauty. I wouldn’t call it a low value skill; rather, quilting is an undervalued, high skill activity. Same with reading! That #2 is such an important part of the equation. It’s one of the things I loved about my bio 201 class in college – it was an overview of some of the major areas (metabolism, cell biology, genetics, and immunology, one area and one instructor per quarter), but the approach was not typical rote memorization. Each instructor was a researcher in that field, and talked about the experiments that lead to our understanding of that field. We therefore learned _how_ we know things, the process of growing and refining our understanding over time. Some of the stuff we learned has indeed changed/refined since then, but because we learned the process rather than lists of facts, the education has been a solid basis that never lost relevance. That’s exactly it – to really understand vaccination, you need to understand how the body works – in exquisite detail. This helps you appreciate all the aspects of immunity as well as infectious diseases. In that way, you some to understand that refinements in knowledge are rarely revolutions. Some directly observed phenomena are now beyond revolution. This. Every new theory had to explain everything the old theory did – and then more on top. Einstein’s theories being more right doesn’t man that Newton was wrong. Newton’s equations still work in everyday situations. Einstein’s just work in more.